I define posture as your default standing position. I look at the global, full-body view when considering posture. Posture is not just about your shoulder and head position. Correct posture cannot be achieved by just pulling your shoulders back and puffing your chest out. It encompasses the entire body, from your toes to your head. In order to align the body with correct posture, we build the foundation first. We must start at the bottom and work our way up. The foundation of posture begins with the feet. We can only build vertically. Once the lower body is aligned, the upper body can follow suit. The toes can rotate internally or externally and both habits cause wonky mechanics further up the body, leading to excess stress on the lower body joints (i.e. ankles, knees, and hips). When the feet are internally rotated, the pose is commonly referred to as "pigeon toes". When you walk or run with an internally rotated foot, you set your knees up to collapse inward. When your knees push towards each other, there is little to no torque in the legs and they become highly unstable. Your hip joint is left loose and relaxed, which sets you up for injuries in the knees, hips, and ankles. A duck foot stance comes from externally rotated toes and is far more common than pigeon toes but equally as dangerous. When the toes are rotated externally, the arch of the foot can collapse. You can test this for yourself. As you move your foot like a windshield wiper on the ground, you'll notice how the arch of the foot becomes engaged as internal rotation occurs but as your foot rotates away the arch collapses and flattens. Like dominoes, your joints and tendons start collapsing one after the other. When your arch collapses, so does the heel cord, and with it the stability in your ankle. As the ankle becomes valgus, so do the knees, which produces instability in the hip joint. Place your feet shoulder width apart, directly underneath you hips. Now straighten them so they are parallel to each other and facing directly in front of you. That's it. Your feet are in a neutral position. Don't worry - all hope is not lost. Your body will retrain itself with a little mindfulness and practice. Correcting duck feet and pigeon toes is more often than not a matter of awareness. When you notice your feet drifting into internal or external rotation (i.e. pigeon toes or duck feet) bring them back to a neutral position. Eventually, neutral feet will be your default. Additionally, it is important to retrain the muscles in the foot. You do this by 1) increasing the amount of time you spend barefoot and 2) weaning off shoes with elevated heels and arch support. You should look for flat shoes with zero-drop from heel-to-toe. My personal recommendation is Vivobarefoot. I currently have three pairs of them: the Motus for weight training, Pure for daily use, and Hopewell for dressier occasions. If we do not engage the muscles surrounding the spinal column, it becomes something like a wet noodle. If the spine is left unsupported for long hours spent standing and sitting, the wear and tear mounts quickly. Now, if you add an extra load to the spine, like wearing a backpack or lifting weights, the compounding stress bloats even more. Herniated disks, here we come! But thankfully your spine was designed to withstand many forms of movement and loading. The key factor is tapping in to the power of the stabilizing muscles around it. When you squeeze your glutes, you align the lower third of your spine, the lumbar region. If you stand up right now and try it, you will feel the pelvic bone tuck underneath the spinal column. This prevents your lower back from going into extension or flexion (a scary place to be, especially when your are supporting weight). With the lumbar region set up for success and glutes still engaged, we can move to he middle third of the spine, the thoracic region. Start by letting out some air, as you do this engage your abs. You should feel your ribcage tilt forward slightly. The ribcage should be directly overtop of the pelvis at this point. Engaging the abs locks in both the middle and bottom third of the spine. Now, the tension in the glutes can be released. In order to keep alignment, Kelly Starrett advocates for 20% tension in the abs while standing, 40% while sitting, and 100% when performing a loaded task like squatting or deadlifting. It is not uncommon to fatigue your abs quickly when beginning this practice. Eventually, your abdominal muscles will strengthen and setting this position will become more natural. 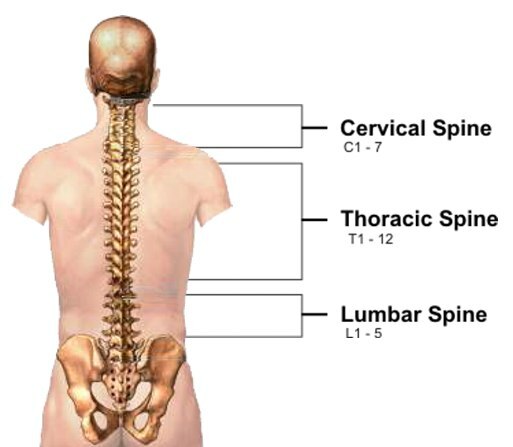 The top third of the spine, the cervical region, is set with shoulder engagement. The most common error with this step is to simply pinch the shoulder blades together. It requires one more piece than that: once the shoulders blades are pinched, they must be dropped down as well. Think about touching the bottom of your shoulder blades to your tailbone. This rolling of the shoulders creates external rotation in the shoulder joint, which leads to tension in the surrounding muscles and thus an aligned spine. This tension in the shoulder is similar to the torque felt in the hip when the knees are driven out during a squat. Note: Your abs should still be engaged. Correct posture demands an engagement of the abs from Step 3 onwards. Simply put, keep your noggin facing forward and directly on top of your spinal column. Do not tilt it forward, backward, or to one side. Watch out for hunching over a computer or iPhone screen. Your head is heavy and every inch it extends farther than it should magnifies the stress on your spine. By starting at the bottom of the body first, creating a foundation built on neutral feet, and aligning the spinal column correctly, your body will be ready to tackle the demands of the day. The biggest obstacle to correcting posture is awareness. When you find yourself out of position, take the time to go through Steps 1-5. It should only take 2-3 seconds once mastered. With practice and mindfulness, this can become your default posture.